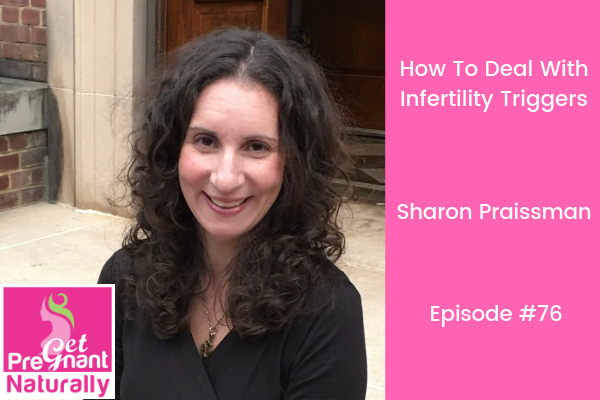 I’m excited to welcome Sharon Praissman Fisher to the podcast. We’re digging into how to navigate triggers during our fertility journey. Sharon Praissman Fisher is dually board certified as an adult (medical) and psychiatric mental health nurse practitioner. She is also a wife, mother, Buddhist lay teacher, and Chesapeake Bay sailor. She is passionate about helping women through all stages of their life and does so though her private practice, Nurtured Well, LLC, in Baltimore, MD. She is co-author of the book Beyond The Egg Timer: A Companion Guide For Having Children In Your Mid Thirties and Older. We’ve all seen the post “trigger warning”. During the fertility journey…there can be A LOT of triggers. Any of these could send you on a downward spiral, which by the way is completely normal. We’ll discuss steps you can take right now…to address triggers. “If the overwhelming majority of us can get pregnant on our own, why do we know so many couples undergoing fertility treatments”? from the book Beyond The Egg Timer. This to me is a call to action – to do things differently (and that’s where functional medicine can make a REAL difference to improve your chances of getting pregnant naturally). Again we’ll ponder the question – why is the fertility clinic our first step? I’m all for technology. (and yes a small percentage of couples do need IVF)..but will we look back in 20 years and wonder what the heck were we doing…rushing to the fertility clinic…when there were SIMPLE steps we could take that would help us get pregnant naturally. 1) How to handle intrusive questions about having children, What to do about a someone else’s pregnancy announcement. 2) What to do when someone complains non-stop about their pregnancy. 3) After a miscarriage, women’s main fear is that they will never be able to have a healthy baby, but there isn’t research to support this fear. We discuss the research. 4) How to move to acceptance. Acceptance is not about being passive. It’s about being firm and brave. Steps you can take now.